Dr Garry Palmer from Sportstest (www.sportstestuk.wordpress.com) explains the benefits of scientific fitness testing - and why there are not just for the elite athlete. I'm not a professional, why do I need a fitness test? 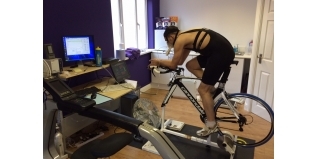 Many people think that they are not good enough to warrant the cost and time of a full fitness assessment that we undertake at Sportstest. They think it is the preserve of only elite athletes! But you're not a professional are you? No! In that case I may surprise you…. It clearly identifies YOUR training zones, not ones that are predicted from maximum heart rate, an FTP test or worst still….based upon your age. It will identify YOUR strengths and weaknesses. This will help you decide what you need in your training plan, and where you can focus your valuable time and attention to get the greatest improvements in your performance, and avoid sessions that are not going to significantly improve your fitness. It will identify your appropriate body composition to hit peak performance on race day, by looking at body fat levels. This can be combined with setting nutritional targets to aid appropriate weight/gain loss and optimal recovery from each training day. It will help you accurately assess whether your training is working, or whether your training plan needs modifications. Most importantly, it allows YOU to maximise your valuable training time, and gain the advantage you are looking for. It feels great to train, but training with focus gives you better results, and ultimately better performance on race day, making even bigger smiles! So, whatever your level, fitness testing can give you clarity and direction in your training, to give you a performance edge over your rivals! Fitness testing in the Autumn will make sure you are doing your off-season work at the appropriate level to gain long-term fitness enhancement. Winter tests keep you on track and motivated. Seeing improvements in areas that you need aid training focus, and help assess changes in strengths and weaknesses. Pre-season or Spring testing, allows for the final tweaks in your programme to make sure you arrive at race day in tip-top shape! So what are you waiting for? Get tested NOW! For more information about what the Sportstest involves, please see our blog article and video. During July we also have a Le Tour special offer!